The venerable American-made CAD E100 Large Diaphragm Condenser Microphone powered by a Mackie Onyx preamp in the audio interface. Sound editing and processing is done on industry-standard Adobe Audition software. Recording is done in a vocal booth designed to eliminate outside sound and interferrence. This ensures that recordings are free of unwanted sound. 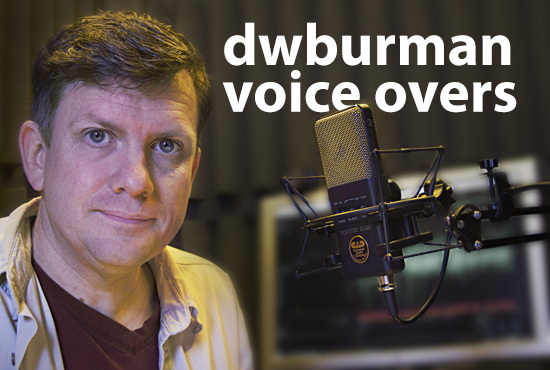 Dana W. Burman's adventures in voice overs. Dana has been working in video production, editing and animation for over 20 years. Around 2014 he started doing voice over work for project he and his colleagues have been working on, providing narration for safety videos and character voices for interactive eLearning presentations. This reminded him of his time as a child playing with a tape recorder and opened up another way to be creative, have fun, and develop a new skill set.